BONTOC, Mountain Province – Gov. Bonifacio C. Lacwasan, Jr. underscored that the provincial government was at the forefront in the conduct of search, rescue and retrieval operations on the tragic landslide incident that buried a 4-storey building of the Department of Public works and Highways (DPWH) at Banaue, Natonin during the height of Tropical Cyclone Rosita. Lacwasan, who presided over the emergency meeting of the Provincial Disaster Risk Reduction and Management Council (PDRRMC) a day prior to the weather disturbance, said that had it not for the timely issuance of the advisory that classes and work will be suspended on October 30 and 31, 2018, there would have been more lives lost because employees would have reported for work and were about to leave the government facility when the unfortunate incident happened. “We were alerted on the expected impact of the weather disturbance to lives and properties that is why we were constrained to make drastic but timely decisions to help minimize the effect of the typhoon to our people,” Lacwasan stressed. Upon learning about the tragic landslide incident, the governor immediately dispatched trained rescuers and volunteers of the PDRRMC to the accident site bringing along with them their equipment for the expected difficult task of having to work through huge boulders of rocks and tons of mud that ruined the structure and claimed the lives of 22 innocent individuals. Lacwasan was also instructed by officials of the Presidential Management Staff (PMS) to accompany and brief President Rodrigo R. Duterte who flew by the accident site a few days after the incident to see the extent of damaged caused by the weather disturbance to some parts of Mountain Province and the Cagayan Valley provinces before holding a briefing in Cauayan City, Isabela. Together with elements of the PNP, Bureau of Fires and the Red Cross, PDRRMO personnel were the first rescue groups to be at ground zero. Led by PDRRMO Edward Chumawar and Padcayan, a convoy of vehicles started in Bontoc last October 30 and was at the accident area the following day since they have to wade themselves through series of landslides. They brought with them rescue equipment, power tools, and food stuff. “There were rescue volunteers when we reached the area but they were not yet organized so we assigned individuals to lead the operations and came up with an incident command post where all activities are coordinated,” Padcayan who was assigned to head the logistics, recalled. He added that a portion of the supply of food for the rescuers during the duration of the search, rescue and retrieval operations came from the available supplies of the provincial government through the PDRRMC. After the President’s fly by, Lacwasan, together with other regional officials who were on board separate government helicopters, tried to land in Natonin but only one of the choppers was able to land while the chopper where he was on board was unable to land so they simply circled around ground zero and then proceeded to the airport where the choppers were based. Lacwasan pointed out that he was eager to be at ground zero the soonest but prevailing circumstances prevented him to be on the site but he was able to issue the necessary instructions to the PDRRMC rescuers and volunteers who took turns in trying to locate the still missing individuals from the rubbles of the ruined structure and nearby areas. The Mountain Province Provincial Disaster Risk and Reduction Management Office (PDRRMO) officially ended the Natonin Search and Retrieval Operation (SAR) at 5:00PM of November 22, 2018 that has gone on for 23 days as well as terminated the Incident Command Post (ICP) established at Ground Zero, Sitio Ha’ rang, Banawel, Natonin, Mountain Province on October 31, 2018 with the remaining six bodies still unrecovered. Since being established, Ground Zero and the ICP has been the temporary home to the responders, leaders, officials and to all other selfless volunteers who had been helping find those buried by the landslide. Subsequently, a Day of Mourning at Natonin, Mt. Province started at 12:00 midnight of Friday and lasted until 12:00 midnight of Saturday where no passers-by were allowed to enter and/or exit at Sitio Ha’rang, Banawel, Natonin and the Natonin community did not work during that time of their “Ngilin”, a local term for mourning. The agency also noted that family members of the missing persons and community volunteers who plan to continue with the search and retrieval are advised to operate on Monday, November 26, where they have to register at Natonin Municipal Station for monitoring purposes and will be accompanied by Natonin MPS personnel to the site for security. Sometimes, man can only do so much. … At 5:00 p.m., 22nd day of November 2018, was the official culmination of the Search and Retrieval Operation that has gone on for weeks and the termination of the Incident Command Post established at Ground Zero, Sitio Ha’ rang, Banawel, Natonin, Mountain Province on October 31, 2018. For 23 days, Ground Zero has been home to responders, leaders, officials and to all other selfless volunteers who had one ultimate objective in mind – finding all those buried by the landslide. According to the National Incident Management System, the Incident Command Post is the location where the Incident Commander operates during response operations. The Natonin ICP, therefore, was the temporary visible management post that has called the shots on all facets of the operations at Ground Zero and at all other sectors where team-responders were deployed. For 23 long days, the ICP has consistently worked with all responders, generated periodic reports and has relayed such to proper authorities. Consequently, this has enabled leaders as well as concerned offices to address the influx of queries and to give updates, not only to families of the victims and to higher authorities, but also to various media outfit[s] who played a great part in information dissemination and which helped in harnessing the much needed help needed for Natonin and at other areas affected by the latest calamities that has beset the province. For the SRR teams, each day of the last 23 days may have also felt like those of their longest. The everyday recount of their ground activities since Day 0 bespeaks of their saga. This morning, church leaders and other authorities led an ecumenical mass for all the stakeholders who have converged at the ICP. The mass was held in memory of all those who perished in the tragic landslide incident. It also meant to give comfort and hope for all the responders who have given their best for the plight of all casualties – the injured, the dead and the missing. Moreover, the mass was the avenue through which the people could be in communion with one another for one fervent prayer – that the high heavens be merciful, take pity on all weary souls and grant their hearts’ desires. During the mass were homilies and sharings meant to give comfort to the bereaved as well as to empathizing hearts. Pastor Ambrosio Simeon shared the Word of God and Pastor Romeo Langtiwan of a Pentecost Church in Natonin shared Words of Comfort together with Fr. Johnny Ambucay(Anglican Church from Besao); Rev. Ferdinand Fulatao; Assistant District Engineer Esther Taynec (DPWH – MPSDEO); PI Cornelio Marawis (3rd Maneuver Platoon, MP- PMFC); SFO4 Antonio Nalibsan (BFP Natonin) ; Mayor Gaspar Chulagan (Aguinaldo, Ifugao); Vice Mayor Jun Lopsuten (Besao); Atty. Edward Chumawar (MP PDRRMO) and Mayor Mateo Chiyawan (Natonin). A meal to break the fast was shared upon by everyone. Thereafter, all the responders embarked on the day’s task. After hours and hours of grueling searches and digging, the efforts remained fruitless. Knowing that their time is almost up, they continued to search frantically over the besieged land. After some time, the heavens seemed to have taken pity on the tired men on the ground. It rained at around 3:00 p.m., thereby, causing the SARO to cease. While everybody was raring to go back to the grounds for one more shot, there was nothing more they could do. As time neared the deadline, the men’s frustration has also become more and more palpable. But man can only do so much. At 5:00 p.m., all SARO teams had to turn in. The men, despite being fully aware that they failed in their quest for finding all the missing ill-fated victims, the die was cast. The ICP has to officially cease to exist. And so with all the SAR operation teams it has worked with for 23 long days. Everyone wished they could have done more. But man can only do so much. In attendance to said 5:00 p.m. brief formalities were Natonin Municipal Mayor Mateo Chiyawan and Vice Mayor Fernandez Linggayo, Aguinaldo Municipal Mayor Gaspar Chilagan, Besao Municipal Vice Mayor Jun Lopsoten, Mountain Province Police Provincial Director PSSupt Clarence Choschos Casilio, APDA PSupt Myles Angel Pascual, PSI Glenn Apangchan – Team Leader of PMFC 1st Platoon, PInsp Cornelio Marawis – Team Leader of 3rd Maneuver Platoon, 54th IB PA (K-9 Unit), PDRRM Officer Edward F. Chumawar, Jr., MPSDEO Assistant District Engineer Esther C. Taynec, MDRRM Officer Ansel Abuac, personnel of other line agencies, various volunteers and families of the victims. As everyone prepared for home, they all had one fervent prayer – that the heavens shall command the grounds to open up and bring forth the remaining missing casualties it has furtively engulfed… and for these bodies to be returned to their loved ones. Also, that everyone who have undergone suffering and who still continue to suffer due to the tragic incidents find peace, acceptance and wisdom in the all that have transpired. The Search and Retrieval Operation was officially terminated at 5:00 pm today (Nov. 22) at the Incident Command Post, attended by Natonin Municipal Mayor Mateo Chiyawan, Vice Mayor Fernandez Linggayo, Aguinaldo Municipal Mayor Gaspar Chilagan, Besao Municipal Vice Mayor Jun Lopsoten, Mt. Province Provincial Director PSSUPT. Clarence Choschos Casilio, APDA PSUPT. Myles Angel Pascual, PSI Glenn Apangchan-Team Leader of PMFC 1st Platoon, PINSP. Cornelio Marawis-Team Leader of 3rd Maneuver Platoon, 54th IB PA (K-9 Unit), PDRRM Officer Edward Chumawar, Jr., MPSDEO Assistant District Engineer Esther Taynec, MDRRM Officer Ansel Abuac, personnel of other line agencies, various volunteers and families of the victims. SAR DEPLOYMENT AS OF 6:00AM OF NOV.22,2018. BONTOC, Mountain Province – After seventeen days of continuous retrieval operations, rescue groups were able to salvage 22 bodies from the killer slide in Natonin which buried 30 people. But even though the retrieval operations were called off last Friday (November 9) relatives of the missing victims have joined Natonin residents and officials hoping to find the bodies of their love ones. Although not physically present at ground zero, many offices and groups continue to help through donations of all sorts. Among the government offices which continuously provide food stuff is the Provincial Disaster Risk and Reduction Management Office. “We moved out from the accident scene but we continue to provide what is asked from us like tools and food stuff,” reported Joseph Padcayan of the PDRRMO. Together with elements of the PNP, Bureau of Fires and the Red Cross, PDRRMO personnel were the first rescue groups to be at ground zero. Led by PDRRMO Edward Chumawar and Padcayan, a convoy of vehicles started in Bontoc last October 30 and was at the accident area the following day since they have to wade themselves through series of slides. They brought with them rescue equipment, power tools, and food stuff. “There were rescue volunteers when we reached the area but they were not yet organized so we assigned individuals to lead the operations and came up with an incident command post where all activities are coordinated,” Padcayan who was assigned to head the logistics recalled. “There was where we felt the spirit of oneness. Regardless of their political or religious affiliations, the people were one in their effort to help in the operations. Among those who provided early donations was Governor Bonifacio Lacwasan who sent food supplies and cavans of rice for the rescuers. Just last Monday, donations from the Bontoc Market Vendors Association were transported to Natonin for those who need it,” added Padcayan. Meanwhile, a parent of one the DPWH employees expressed his thanks to the governor for suspending office works and classes last October 30 and 31. “The foresight of the governor saved many lives. Should the office works were not suspended many other could have perished in the slide,” she said. The Mountain Province PDRRMO reported in its latest update that two more bodies were retrieved on November 14, 2018, bringing the total bodies retrieved from the Natonin landslide to 22. Three of the cadavers remain unidentified as of the moment. The agency counted the unidentified cadavers as retrieved but did not reflect them in the list of missing persons until identified and confirmed to have been missing. BAGUIO CITY – Mayor Mauricio G. Domogan ordered the City Disaster Risk Reduction and Management Council (CDRRMC) and the City Social Welfare and Development Office (CSWDO) to study the possibility of the local government allocating some funds to give to Natonin town as calamity assistance after it was ravaged by Tropical Cyclone Rosita. Aside from the possible provision of financial assistance to the Natonin municipal government, the local chief executive also instructed CSWDO personnel to look into existing policies of the local government that will allow the granting of financial assistance to the bereaved families of the 3 fatalities who died in Natonin who are residents of the city. “We sympathize with the officialdom and the people of Natonin after it was ravaged by Typhoon Rosita. We have to look into ways on how we can help in the recovery and rehabilitation of the municipality because the people will surely need all the help from various sectors inside and outside the municipality to allow them to recover from the effects of the typhoon to life and limb,” Domogan stressed. He underscored the tragic landslide in Natonin should serve as a wake up call to everyone so people can combat to a degree the serious negative effects of climate change to the state of the economy of a certain locality and the sources of livelihood of the people living in the different communities frequented by natural and man-made calamities. According to him, Baguio City is just lucky it was not severely affected by the recent typhoon and thus it is able to share resources to Natonin, the hardest hit municipality in the region, for the local government to have some resources to use for its recovery and rehabilitation plans. Domogan claimed the local government empathises with the plight of Natonin officials and people thus it is sharing some available funds and resources. Earlier, the local government had been allocating funds from the local disaster and risk reduction fund as the city’s financial assistance to local governments affected by typhoons for the past several years. Under the pertinent provisions of Republic Act (RA) 10121 or the Philippine Disaster Risk Reduction and Management Act of 2010, local governments are mandated to allocate 5 percent of their annual budget for their prepared disaster risk reduction and management fund for use during the natural and man-made calamities where 70 percent will be used for prevention and mitigation programs while 30 percent will serve as quick response fund. 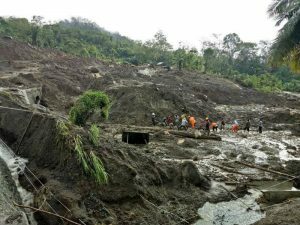 The Mountain Province PDRRMO reported that two more bodies, one of them confirmed to belong to a male, were retrieved from the Natonin Landslide rubbles, making the total casualties for this tragedy 20. The first unidentified male cadaver was recovered at 5:10 PM while the second cadaver was retrieved at 5:59 PM, today, November 10, 2018. Earlier in the in the morning one complete right lower extremity human body part was retrieved at 10:43 AM. All cadavers and body part were recovered at Sector 3. This development brings the total unidentified cadavers to five, two of which are at Carbonel Funeral Parlor Service at Alfonso Lista, Ifugao. 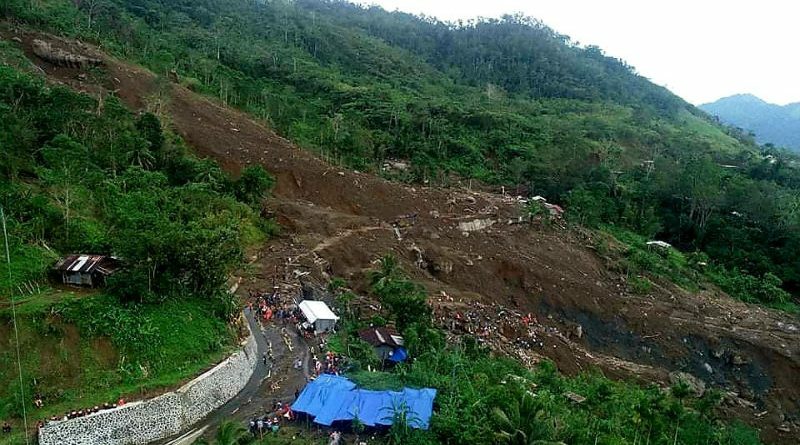 The Mountain Province PDRRMO reported that another casualty has been recovered from the rubbles of the Natonin Landslide, making the total bodies recovered to 18. The body, however, is still to be identified. Overall, three cadavers are still unidentified, counting the two others which were at Carbonel Funeral Parlor Service at Alfonso Lista, Ifugao. It also reported that there are still 11 missing persons as of 6:00 PM. In a related development, the agency confirmed that the head of Search and Retrieval Operation (SAR), Brigadier General Leopoldo Imbang, Jr. recommended the hand over of the SAR operation to the Provincial Local Government of Mountain Province and to Local Government Unit of Natonin. Furthermore, the SAR head emphasized that the national government contingents will only be temporarily leaving the site but he also ensured that they will be supporting the continuous operation and that they are on call as the need arises. The agency also reduced the number of missing persons to eleven following this development. This also increased the identified bodies to 15. The two cadavers that were brought to the Carbonel Funeral Parlor Service at Alfonso Lista, Ifugao remain unidentified as of yesterday afternoon. The unidentified cadavers were counted as retrievals but not reflected in the list of missing persons until identified and confirmed. NATONIN, Mountain Province – The death toll from the tragic landslide incident that ruined 4-storey building of the Department of Public works and Highways – Second Mountain Province District Engineering Office (DPWH-SMPDEO) rose to thirteen after rescuers were able to recover six more cadavers from the rubbers of the structure and nearby river system late Thursday afternoon and around Friday noon. Mayor Mateo Chiyawan claimed that late Thursday afternoon, rescuers were able to extracted a cadaver from the rubbles of the flattened DPWH building, two other cadavers were recovered from a river below the structure while another cadaver was recovered in Balanao, Paracelis town which is several kilometers away from the landslide incident. At around Friday noon, the local chief executive reported that another cadaver was recovered in Paracelis while one cadaver was recovered in ground zero wherein all of the recovered casualties are now subject to identification by their relatives and elements of the Scene of the Crime Operation (SOCO) team deployed in the area. Further, two other cadavers were recovered on ground zero and were also being processed in the area. Of the 13 reported casualties, 8 persons were already identified by their relatives while 5 others are still undergoing identification by their family members in a local hospital with the assistance of personnel from an Ifugao-based funeral homes. Among the identified fatalities include Benito Longan, Junjun Laron, Joel Arevalo, Elberto Cano, John Tinmakcheg, Juanita Longan, Boyong Castro and Mike Saleo-an. “Our rescuers are working double time to recover the bodies of the victims of the tragic landslide incident for the sake of their families and relatives. We hope that we will be able to further advance in the on-going search and rescue operations to account for all the victims,” Chiyawan stressed. With the recovery of the 8 cadavers over the past two days which was in addition to the five other recovered fatalities, he claimed that the missing persons had been reduced to 16. Chiyawan expressed his gratitude to Public works Secretary Mark Villar who personally supervised the clearing of numerous landslides along the Paracelis to Natonin road that allowed a punch through status up to ground zero Friday noon while on-going works are still underway for the removal of landslides from Banauel to Poblacion which has a span of approximately over 2 kilometers. According to him, the town needs additional food and relief supplies not only for the residents but also for the rescuers who are working round the clock to retrieve the remains of the victims who were trapped inside the rubbles of the deviated building. He claimed that rescuers embraced a new plan that will allow the distribution of all volunteers in strategic areas within the vicinity of the accident site so that all angles of ground zero will be covered to fastrack the retrieval operations for the sake of the families and relatives of the missing victims. The chairman of the local disaster risk reduction and management council pointed out that one of the obstructions of the on-going operations is the fear that huge boulders of rocks from the mountain slope where the landslide came from will gain full on ground zero that could result to further accidents, thus, rescuers are taking their time to implement their assigned work for safety purposes. Chiywan also expressed his gratitude to officials of government agencies who are now in the municipality supervising the conduct of the search and rescue operations and the relief operations to the victims of the recent onslaught of Tropical Cyclone Rosita. Chiyawan said the identities of the recovered fatalities will be issued after all the appropriate procedures shall have been completed by the responsible officers tasked to perform the said task. The Mountain Province Provincial Disaster and Risk Reduction Management Office (PDRRMO) reported that three (3) more bodies were retrieved from Ground Zero of the Natonin, Mountain Province landslide at around 4:00PM, November 1. The bodies remain unidentified and could not be confirmed if they were included among the 22 missing persons. Details to follow as they become available. Meanwhile, President Rodgrigo Duterte granted the request of Mountain Province Governor Bonifacio Lacwasan for the airlift of food and other supplies to the disaster stricken ares of the province during the press briefing conducted in Cauayan, Isabela yesterday evening. Earlier in the afternoon, the President and the Governor, along with other government officials, conducted aerial inspection of the damages to the province caused by Typhoon Rosita. NATONIN, Mountain Province – More than three hundred rescuers are now in this town searching for the twenty two reported missing persons who were buried alive when a huge avalanche of rocks and mud covered a four-story building of the Department of Public works and Highways – Second Mountain Province District Engineering Office (DPWH-SMPDEO) at Hacrang, Banauel, here, Tuesday. Mayor Mateo Chiyawan revealed that the rescuers came from the Philippine Army, Philippine National Police, Bureau of Fire Protection (BFP) who are working round the clock in the site to look for possible survivors of the tragic incident and retrieve the cadavers of those who were not lucky to survive the landslide. On the second day of search and rescue operations, the local chief executive claimed that rescuers have a difficult time extracting a cadaver from the rubbles of the building while verification is still being done whether or not a cadaver recovered along the river below the DPWH-SMPDEO structure and another cadaver that was recovered in Bananao, Paracelis town are part of the ones that were earlier declared to have been missing due to the tragic landslide incident. 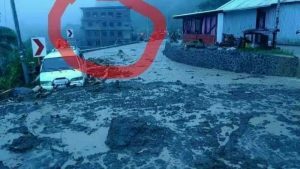 “We need all the support from concerned government agencies but our major concern now is our town remains isolated because of the numerous landslides along national roads leading to the locality. We have sufficient supply of food but we fear that it will not be sufficient if roads leading to our place will remain closed for a number of days,” Chiyawan said. Earlier, five people died, twenty two others are still missing while fourteen individuals were able to survive a huge landslide that buried a four-story building of the Department of Public works and Highways – Second Mountain Province District Engineering Office (DPWH-SMPDEO) at Sacrang, Banawel, here, Tuesday afternoon. Chiyawan claimed that the occurrence of the landslide was reportedly triggered by the strong winds and heavy rains brought by Tropical Storm Rosita which traversed the Cagayan Valley, Cordillera and Ilocos Regions Tuesday that resulted to the occurrence of numerous landslides, floodings among other damages to life and limb in the said places. Initially, the fatalities were named as Benito Longan, Junjun Laron, Mike Saliw-an and Joel Arevalo while one recovered dead person remains unidentified as of press time. In the case of Saliw-an, Chiyawan explained that he was about to respond to the pleas for help by the ones inside the structure when he was carried away by the strong water current of a creek that he was crossing en route to the site of the accident. On the other hand, Chiyawan named the survivors of the tragic landslide incident as Joventino Lammawin, Inocencio Gollingoy, Jr., Jupiter Gaawan, Francisca Gollingoy, Jordan Polic-ew, Ryan Polic-ew, Erwin Adlucan, Andrew Borillo, Edot Arucan, Junior Amon, Oliver Lamarca, Jefryl Lamarca, Reagan Gollingoy and Fritjerald Lumpanga. “The landslide is much bigger compared to the landslide that recently happened in Itogon. Rescuers are having a difficult time conducting the manual search and rescue operation because of the volume of rocks and mud that buried the structure and the houses of people living near the said office,” Chiyawan stressed. He explained that the increase in the number of survivors was due to the fact that most of them were shocked on what they saw and immediately sought refuge in the houses of their relatives last night before reporting to the municipal disaster risk reduction and management office for them to be delisted from the missing persons due to the landslide incident. He disclosed that 2 of the 14 survivors were considered to have been rescued last night because upon seeing the flow of mud and rocks from the mountain slope, they were able to seek cover from a box culvert in the area and tried their best to maneuver themselves out to be seen by the initial wave of rescuers who were dispatched in the site. 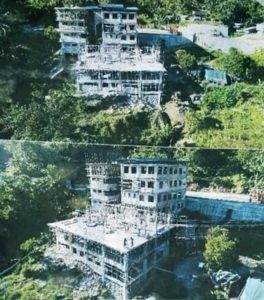 Earlier, it was reported that those who were trapped inside the government structure being built by two contractors included 20 laborers, 3 security guards, 6 to 7 residents in the area and a project engineer. Emergency responders from other neighboring provinces have a difficult time extending assistance in the remote area because all roads leading to this town are allegedly closed due to various landslides along the way which were caused on the wrath of Tropical Cyclone Rosita, thus, units of heavy equipment from various DPWH offices nearby were mobilized to clear the slides to allow volunteers and relief supplies to be brought to the town proper. The buried DPWH structure is located below the Bontoc-Barlig-Natonin-Paracelis national road and it is undergoing construction after the creation of the DPWH-SMPDEO over two years ago through legislation. Chiyawan said that the continuous rains is contributing to the delay in the conduct of search and rescue operations for the reported missing individuals. NATONIN, Mountain Province – Five people died, twenty two others are still missing while fourteen individuals were able to survive a huge landslide that buried a four-story building of the Department of Public works and Highways – Second Mountain Province District Engineering Office (DPWH-SMPDEO) at Sacrang, Banawel, here, Tuesday afternoon. Mayor Mateo Chiyawan claimed that the occurrence of the landslide was reportedly triggered by the strong winds and heavy rains brought by Tropical Storm Rosita which traversed the Cagayan Valley, Cordillera and Ilocos Regions Tuesday that resulted to the occurrence of numerous landslides, floodings among other damages to life and limb in the said places. Natonin, Mountain Province – Some 30 people were trapped inside the building of the Department of Public Works and Highways (DPWH) – 2nd Mountain Province District Engineering Office after the structure was buried by a landslide at the height of the onslaught of Typhoon Rosita Tuesday afternoon. 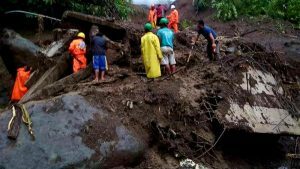 The landslide incident allegedly happened at around 4:00-5:00 PM wherein a huge volume of debris that came from a mountain slope buried the government structure located along a road in Barangay Banawel, here. The said structure served as a temporary shelter for still undetermined number of evacuees and DPWH personnel who were on duty at the time of the incident. Rescue operations are now underway for the possible rescue of the trapped individuals inside the structure. Initially, three (3) casualties were already recovered by emergency responders who are in the area conducting search and rescue operations.